De’Andre Hunter declared for the NBA Draft and said he will hire an agent on Monday, joining Ty Jerome as Cavaliers who will depart for the pros early this offseason. Hunter, a first-team All-ACC selection, also won the ACC and NABC National Defensive Player of the Year awards. A redshirt sophomore, Hunter averaged 15.2 points, 5.1 rebounds and 2.0 assists this season. There’s a ton to like about Hunter’s game, but the first thing that stands out, as those awards show, is the defense. At 6-foot-7 and with a long wingspan and great quickness, Hunter is an extremely versatile and gifted defender. Throughout the season, Tony Bennett could shift him around as he saw fit, and that meant Hunter guarding any position from point guard to power forward. 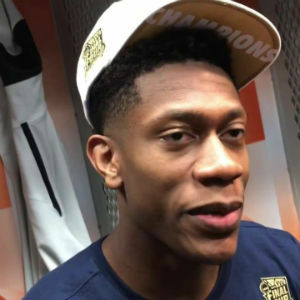 Hunter helped hold fellow projected lottery pick Jarrett Culver of Texas Texas to just 5-of-22 shooting in the championship game and said afterward he simply wanted to prove he is the better player. While Hunter immediately projects as a high-level defender as soon as he reaches the professional ranks, his offense is also a large reason why he could be Virginia’s first top-10 pick in over 30 years. Hunter blossomed on the offensive end of the floor this season. He shot 43.8 from three this season, up from 38.2 percent last year. He also remained a relatively efficient mid-range scorer, knocking down 42.8 percent of his two-point jump shots. But where Hunter improved most was around the rim, where he jumped from 60.6 percent last year to 68.6 percent this year. Hunter truly became a near-unstoppable force when he got his jumper going. The best such example was the second half and overtime against Texas Tech. He saved his best for his last, connecting on seven of eight shots over those 25 minutes. He finished with a career-high 27 points, and 22 came after halftime. When Hunter is able to knock down the three and the mid-range jumpers he often gets off easily because of his length, that allows him to get going off the dribble as well. Hunter is adept at attacking the basket and finishing either at or near the rim. He has an array of ways to score in the post, and when defenders bit on the pump fake, he could get in the lane and either score or, when the defense collapsed, pass it out to an open teammate. His drive-and-kick to Jerome moments before the first-half buzzer in the championship game illustrated this to perfection. Hunter also shot 255 free throws over the past two years, nearly double what the next-closest Cavalier shot. However, when Hunter’s jumper wasn’t falling, opponents could play a few more inches off him, which made his driving less effective. After a strong game against Gardner-Webb, Hunter had four-and-a-half-game stretch in which he shot just 2 for 14 from deep. He averaged just 11.3 points per game between the opening round and the championship. While his jump shot improved vastly over his time in Charlottesville, it needs to continue to do so at the next level so he can keep opponents off balance. Hunter also must improve as a ball-handler. He wasn’t asked to do much in this area as a college player, as Virginia usually had three guards — Jerome, Kihei Clark and Kyle Guy — who could handle the vast majority of the load. Hunter isn’t a bad ball-handler per se, but he could certainly tighten things up, especially with his non-dominant left hand. He had four turnovers against a physical, aggressive Texas Tech team, the only real blemish on an otherwise outstanding performance. After ACC play started, Hunter became one of the most consistent players in the nation offensively, scoring double digits in all but two games. There are times where he could have been more aggressive, though. He shot just nine times in a loss to Duke in Charlottesville and was similarly quiet in the second half of Virginia’s ACC Tournament semifinal loss to Florida State. Only twice did Hunter take more than 15 shots: against Gardner-Webb and Texas Tech. The results in both were very good. He won’t need to be told twice to shoot the ball more in the pros, especially if he is drafted to a team early in the rebuilding process. Even if he’s not, Hunter projects as a terrific role player — an outstanding defender who can create his own offense — immediately. With NBA athleticism and an NBA frame, Hunter has the tools to be a great early pick. He’ll only improve as a shooter and ball-handler, and the defense is already NBA-ready. If he ends up in the right situation, he can grow into a star as a small-ball power forward with lockdown defensive ability and a budding offensive repertoire.